Give your take out dish an attractive presentation with our small sized take out containers. 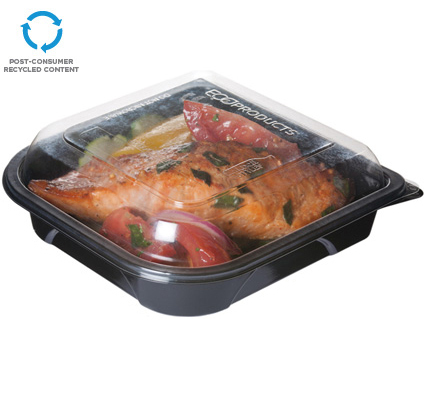 BOTTOM - Width: 5-7/8" Length: 5-11/16" Height: 1-3/8"
TOP - Width: 5-3/4" Length: 5-3/4" Height: 15/16"
Your food serving will look better when using our medium sized take out food containers. BOTTOM - Width: 6-3/4" Length: 6-9/16" Height: 1-3/8"
TOP - Width: 6-5/8" Length: 6-5/8" Height: 15/16"
Our large black bottom containers to go boxes will give your food a premium look. BOTTOM - Width: 8-15/16" Length: 8-3/4" Height: 1-9/16"
TOP - Width: 8-13/16" Length: 8-13/16" Height: 1-3/8"